Tradition! It is what keeps the Jews in the little Russian village of Anatevka around the turn of the 20th Century grounded and able to weather the turbulent changes taking place around them in society. Tradition also is one of the things that keeps audiences coming back year after year to see Fiddler on the Roof , the Jerry Bock and Sheldon Harnick musical that has been playing Broadway revivals, anchoring community theater seasons and giving kids their first starring roles on high schools stages ever since it stormed the Tony Awards 50 years ago (there even is a movie adaptation). So tweaking with the norm can be risky. We expect to see a Tevye like the one created by Zero Mostel (who became synonymous with the role), and the story (based on stories by Sholem Aleichem) told in pretty much the same way we have seen it in the other 50 productions we have seen. Director Rob Ruggiero changes the focus for the production running over at Goodspeed, which has been extended through Sept. 12. Some choices for this production succeed (particularly in the casting of the outstanding Heller, who brings depth and humor to create a Tevye all his own). Other changes are hard to embrace. Change is hard. It’s a delicate balance – for the Jews of Anatevka as well as for the show’s creative team. The setting here, designed by Michael Schweikardt, is a stark, birch-tree backdrop with the façade of a couple of dwellings on either side of the stage (one providing the roof for the fiddler, where I doubt a bunch of people seated house right could see him.) All of the scenes come to life with the aid of simple props and by taking the focus off elaborate sets, Ruggiero highlights the personal stories and relationships. We get insights into characters we have seen many times, but never knew as well before. There’s dirt-poor, Tevye (Adam Heller) who ekes out a living as a milk man to support his wife, Golde (Lori Wilner) and their five daughters including Tzeitel (Barrie Kreinik) Hodel (Elizabeth DeRosa) and Chava (Jen Brissman). Clinging to his Jewish traditions gets tricky when Tzeitel want to marry for love. She begs for a chance at happiness and to marry whom she loves: poor tailor, Motel (David Perlman) rather than wealthy butcher Lazar (John Payonk), with whom her father has arranged a marriage, thanks in part to the meddling of matchmaker Yente (Cheryl Stern). That’s how things are done: matchmakers strike a bargain and the fathers decide. What is this new love factor, Tevye ponders? When he gives in, it seems to set off a chain reaction of change, not unlike the one taking place around the village. Jews are being forced to leave their homes and villages in Imperial Russia. Hodel finds herself drawn to revolutionary Perchik (Abdiel Vivancos) who teaches about the evil of employers and urges the people to unite. They don’t ask Tevye for his permission to marry, but do want his blessing. The last straw for Tevye is when Chava becomes involved with a non Jew, Fyedka (Timothy Hassler). That is breaking with tradition and faith too much. The recap I just gave sounds much more serious than the tone I usually think of for Fiddler. That’s what bringing the focus to the people and their situations does. I came away thinking more about the relationships and struggles rather than the great songs like “Tradition,” “If I Were a Rich Man” and “Sunrise Sunset,” among others. Tevye and Golde’s “Do You Love Me” is particularly moving and sharply defined by the events which have taken place. The connection between Heller and Wilner is natural and informs the characters. We are so happy they find that after 25 years of an arranged marriage, they really do love each other. So what other things work and which ones don’t in this production? · Ruggiero’s placement of a live fiddler (Max Chucker) as a participant or observer in the scenes where traditions are celebrated is a stroke of genius. It’s a constant reminder of the theme. 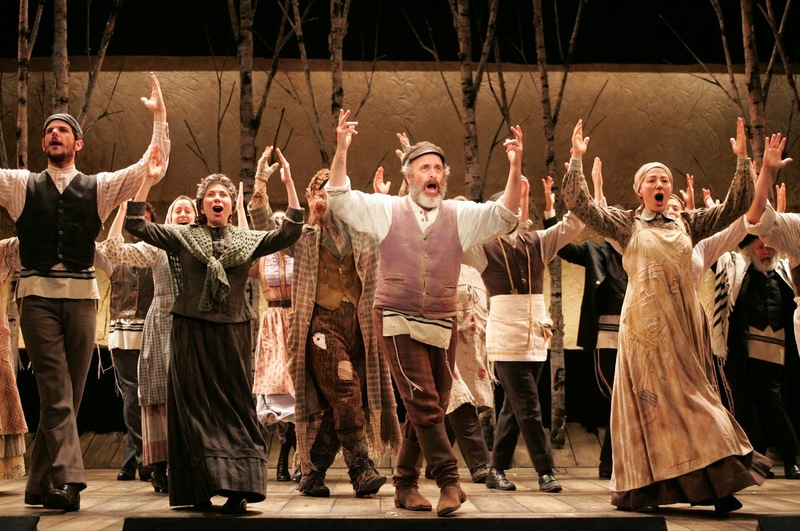 · Joy Hermalynis terrific in the minor part of Fruma Sarah, Lazar’s dead wife whom Tevye conjures in a dream. Loved the costume with the huge pearls! · Goodspeed’s small stage is always a challenge and without multi levels to increase space, big musicals always look crowded on it. That’s the case here and odd hand and arm choreography by Parker Esse, possibly to create motion without actors having to move, looks out of place and is distracting. · Stern is miscast as the matchmaker. She doesn’t look the part (a black wig with a few gray curl doesn’t do it) and doesn’t have the timing or intonation on the jokes. · The seven-person orchestra (Music Direction by Michael O’Flaherty; Assistant Music Direction by F. Wade Russo) isn’t enough to carry this score. In addition, orchestrations by Dan DeLange sometimes stand out as annoying. “Far From the Home I Love” took focus off the song and put it on the music. A single instrument seemed to be playing a tune completely different from and competing with the one the actress was singing. · There is no chemistry between the daughters and their romantic selections. During “Miracle of Miracles,” Motel was beaming, but Tzeitzel was looking just about as unhappy as she was about marrying Lazar. · The musical numbers are missing some oomph and the first act, though it clocked in at just over an hour, seemed very long. When we focus on the people and relationships, the flaws become more noticeable under the magnifying glass. Shifting and changing is hard in the process, but often worthwhile in the end. Heller’s performance alone is worth a trip to see this production. Fiddler plays through Sept. 12 at Goodspeed Opera House, 6 Main St., East Haddam. Performances are Wednesday at 2 and 7:30 pm; Thursday at 7:30 pm and select matinees at 2 pm; Friday at 8 pm; Saturdays at 3 and 8 pm; Sunday at 2 pm with select performances at 6:30 pm. Tickets $27-$82.50 860 873-8668; www.goodspeed.org.